I was on what I’d decided was going to be the last repeat when the so-obvious smacked me upside the head: I know who wears turquoise. (Which this is in real life.) A lot. Like, does she ever wear anything that’s not? Her dad just passed away–you know she could use a good hug. And she’s a knitter! 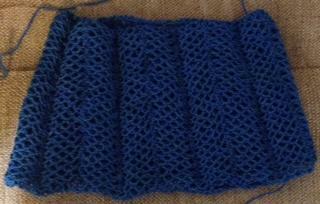 I used 40 grams of the merino/silk and I have 90 g left. We’ll see how the length and fit of the thing looks once that lace is dried, and if I need to make a second on a larger scale to match her better, I certainly have plenty to do it with. I’ve wanted to knit for her for a long time and at last I have a plan. And maybe even the cowl. Meantime, this is how the back of the pattern that my Water Turtles shawl is done in looks like, and I just think it’s really cool. What a gorgeous colour! Go you!!! That looks so cool! I love it when the “wrong” side is fun too.